Read our guide to doing battle in the game's endless dungeon. We've spent today clattering through barriers, spearing unspeakably unpleasant creatures, and hoovering up a small fortune in Simutronics' One Epic Knight. We published our review earlier today, now here's our beginner's guide to getting on top of this latest endless-runner. Pay attention to the challenges you're given at the start of each run as you'll be rewarded with a healthy chunk of change for completing them. If you're challenged to reach a certain distance, then you might want to play it a little more cautiously. 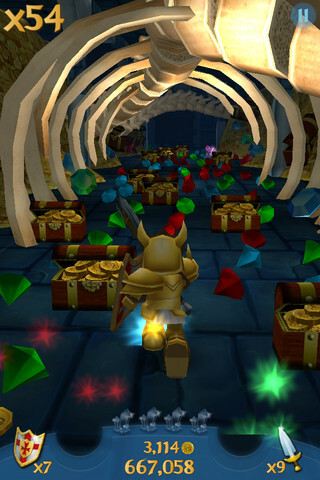 If you need to hoover up a certain amount of loot, keep your eyes on the coin trails and make sure you grab those treasure chests. How do I avoid monsters? If you can see a monster up ahead (particularly a static one) and you haven't been armed with a sword, don't pass it in an adjacent aisle as they have a tendency to hop over one lane and squash you. Try and keep at least one lane between you and the enemy at all times if you can. Unless a trap is stopping you from doing so, head into each corner in the middle lane. 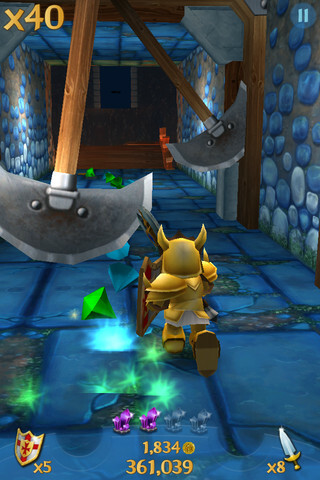 That will give you the best chance of avoiding any spikes or barriers that might be spawning on the left or right hand sides of the dungeons. A favorite trick of the game is to place a trio of three gray plates on the ground with one a little further ahead than the others. Tread on any of them and you will die from the surprise spikes, so do a little weave through them while re-centering yourself before any turns. What are shields and swords used for? 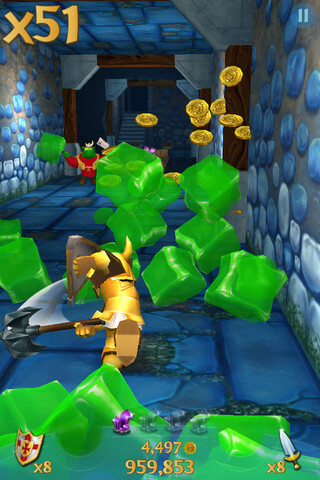 If you've picked up a shield, you definitely want to charge headfirst into any obstacles for a tasty multiplier. You won't die, you'll smash them to a thousand pieces. Likewise, swords will allow you to slice through enemies and grab a reward for doing so. As we mentioned in our review, the game has a tendency to throw a leap at you that's not easy to spot against the color scheme of the dungeon. Always keep your eyes peeled for these, and be ready to leap at a moment's notice. Obviously you're not hoovering up all of that gold and treasure for the hell of it, so what can you spend it all on? Here's the low-down on what's available from the store, and what you can use it for. As a general rule, upgrade all of these items one after another for maximum benefit from your next run. Want to increase your weapon-based score multiplier? Purchase new levels here to extend your multiplier. 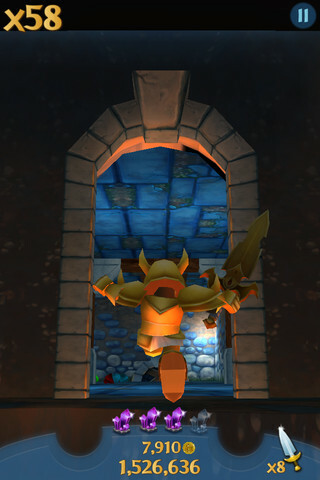 The same effect as the Weapon Upgrade, but applied when you're smashing your way through obstacles and generally trashing the castle. Investing into this category will make your Rampages last longer and have an enhanced multiplier effect. Need more mana in your life? Throw some coins at this particular upgrade and they'll appear more often. 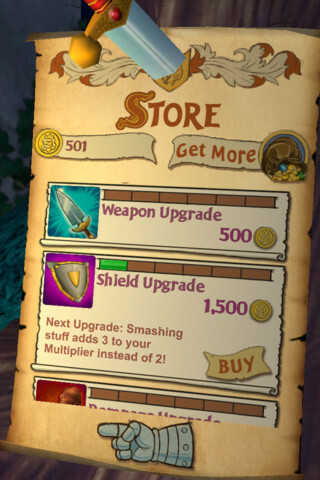 Spending money to make more money: ah, the joys of the upgrade store. Still, if you want to gather more coins from those precious treasure chests, upgrade their booty here. Equipping this fiery number before a run will allow you to summon ferocious fireballs that will not only kill critters, but seek them out for you so you can concentrate on grabbing more cash. If you're feeling at the peak of your game and reckon you can perform a killer run, quaff one of these before you head in to double your score multiplier. A familiar option for most endless-runners, this potion will give you a head-start in the dungeon, so you can get stuck into the juicier loot sooner. Pick up three times as much money for killing helpless critters, you mean hero you. Self-explanatory really. Save yourself from an early expiration at the hands of the dungeon denizens with this reviving brew. Get this potion down you before you start and you can enjoy the spawning of more weapons, shields, rampages and mana crystals. Lasts for just the one run though. When you've exhausted all of the other upgrades in the game, why not spend that hard earned cash on dressing up like a chicken (30,000 coins), a Dread Knight (30,000 coins), a marathon-running knight (20,000 coins), or a Mayor Knight (20,000 coins).